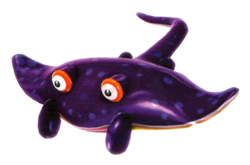 Ray is a Manta Ray that made its only appearance in Super Mario Galaxy. The two galaxies that Ray appears in are the Loopdeeloop Galaxy and the Loopdeeswoop Galaxy, where it carries Mario through the water. In both galaxies, there is always a very large swimming course that Ray must carry Mario through to get him to the Power Star. Mario must participate in ray surfing, a game orchestrated by the local Penguins. The Manta Ray that Mario is given to surf on was named Ray, according to one of the penguins. On Ray, Mario had to surf along the water without falling off and into the atmosphere below. At the beginning of the Loopdeeloop Galaxy, Coach the penguin gives Mario a lesson on how to properly ride Ray without falling off. Mario and Ray have to compete in the Manta Ray races to see if they can get the best time and get the Power Star from Coach. Sometimes while searching the far-off reaches of the galaxy, Mario needs a break to have some fun. 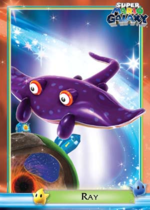 Upon entering the Loopdeloop Galaxy, Ray the Manta Ray appears for a game that the penguins like to play, Called "ray surfing." Ray takes Mario for a ride, and as a reward for his good intentions, Mario is provided with a Power Star! In the Super Mario Mash-Up Pack in Minecraft, Phantoms are replaced by Ray.